Since our inception 44 years ago, we have had the pleasure of sharing in the lives of thousands of talented young people. Periodically, we will share stories from some of our alumni. Today, we’d like you to meet Rachel Haywood. We asked her some questions about her time with FWCC and what she’s up to now. 1- When were you a part of the FWCC? I was involved with the Fort Wayne Children’s Choir from 2005-2015. 2- What is your favorite FWCC memory? Trying to pick one favorite memory is literally impossible, but I can say that each year was better than the last, and I cherished each local, national, and international opportunity that I got to share with my friends! We became family. I really enjoyed the little moments. 3- How did involvement with FWCC impact your life? Singing with the FWCC has been by far the most rewarding experience of my life. I learned important life lessons right next to the invaluable music skills that have shaped me to be the person I am today. I may have graduated 2 years ago, but I still have memories and skills from my time with the FWCC. 4- What are you doing now? I am about to start my junior year of college at Ball State University where I am studying English with a concentration in Creative Writing and a minor in Professional Writing and Emerging Media. I look forward to becoming more involved around my college campus! 5- Is there anything else you’d like to share? FWCC has the potential to change anyone’s life. I recommend the program to everyone, no matter their age or singing ability. Even if someone involves themselves for a year, they will experience a wide range of musical and cultural opportunities that will teach them more than they can imagine. I still keep in touch with a lot of choir friends including one I’ve roomed with at college and it’s easy to catch up like we never left. Friends are family. 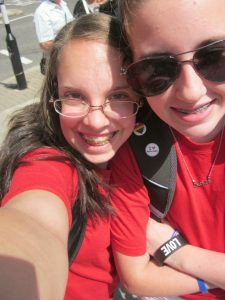 The first picture is of Rachel Haywood and fellow alumna Sarah Ceckowski (her freshman year college roommate) on their first international trip to England in summer of 2011. 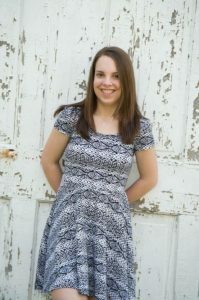 The second is one of her high school senior pictures from 2015. If you’d like to share your alumni story, email Amber Foster at afoster@fwcchoir.org.